One of the striking things about images of the brain is the use of fluorescent markers to show particular features under the microscope. 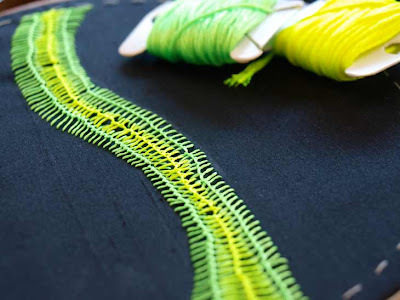 My first embroidery was worked in a lime green silk thread that approximated the colour of the fluorescence but did not have the same vibrancy. The embroidery above uses DMC's Fluorescent Effects threads, which certainly have the vibrancy I was seeking, yet the texture leaves a lot to be desired. The threads are 100% rayon, and they are slippery little suckers. They don't grab the fabric or the neighbouring fibres in a satisfactory way, and the stitches slip and slide as you work them. The stitch I used here is Knotted Loop Stitch, one I hadn't tried before Sharon Boggon revealed it as the stitch of the week on her excellent blog, Pin Tangle. It's a very enjoyable stitch to work, but I would recommend a thread with a softer texture; next time, I'll stick to silk or cotton.